Medics know better than most about the long-term damage a hunger strike does to the human body. Yet junior doctors in Poland have felt compelled to take just such drastic action in order to make their voices heard. About to enter their fifth week on hunger strike, the 20 doctors at Warsaw's Paediatric Hospital are losing hope that the government will agree to their demands for more government spending on the country's health services. They say healthcare is on its knees and they are being overworked. Image caption Dr Matyja says the protesters' demands "are being met with a financial brick wall"
Dr Piotr Matyja was one of the first doctors to join the protest. He was also among the longest lasting, giving up food for 12 days before being "disqualified" by fellow protesters on medical grounds. Having regularly worked 80 hours a week he says: "I have seen from the front line what is happening to Poland's health services. "Doctors want to care for their patients - but we are being met with a financial brick wall that is stopping us. Don't Poles deserve a decent health service?" Last year, the Polish government spent 4.4% of the country's GDP on health services. That puts it among some of the lowest-spending countries, according to the intergovernmental economic organisation OECD - just above Turkey (3.4%) and Latvia (3.2%). Figures for 2016 show that the German government contributed the highest percentage of its GDP to health services - 9.5% - and Sweden was in second place, spending 9.2%. Poland's junior doctors are calling for a steady increase up to 6.8% of GDP by 2021. The Polish government has held talks with the doctors. Health Minister Konstanty Radziwill met them last week and promised an increase to 6% of GDP by 2025, under a proposal approved by the government. But he also condemned the strike, warning that "one should not toy with the health and life of patients". The government's offer was dismissed as "unrealistic" by Dr Joanna Matecka. Speaking on behalf of the doctors, she accused the government of "not treating us seriously, they are not outlining any realistic proposals, they just want us to stop the hunger strike". Dr Patrycja Pieczka and Dr Malgorzata Koziel, both on their fourth day without food, are quick to point out that they are not neglecting their patients. "I feel so strongly about this I have used all of my leave to be here. I am not missing out on work. I don't want this to impact on my patients. I will simply not get a vacation anytime soon," Dr Pieczka says. Dr Koziel adds: "We have been holding protests for the past two years, reaching out to the government, highlighting the dire state of the health service, but with no response. So we feel there is no option but to resort to a hunger strike." The junior doctors also want less bureaucracy and a pay rise. Currently after seven years of studying and working on the wards a junior doctor in Poland can expect to take home around 1,833 zloty ($500; £381) a month, roughly the cost of renting a small flat in the capital Warsaw. By comparison a British junior doctor can expect a basic starting salary of £1,910 ($2,500) a month. The number of doctors abstaining from food always remains at about 20. They are regularly checked by other physicians who volunteer their time in support of this cause. When one person is deemed medically unfit to continue they are "disqualified" and replaced by another volunteer. 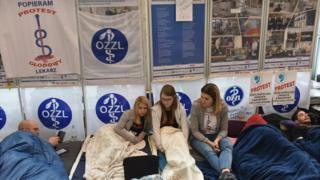 The hunger strike has spread, with doctors also taking part in Szczecin, Leszno, Lodz, Gdansk, Krakow and Wroclaw.